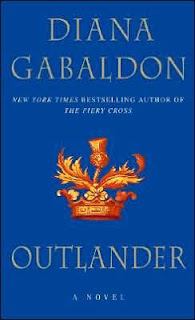 I just finished Outlander yesterday by Diana Gabaldon. I decided to re-read this series since the newest book will be coming out later this year and I wanted to catch up on all of the information I have forgotten. 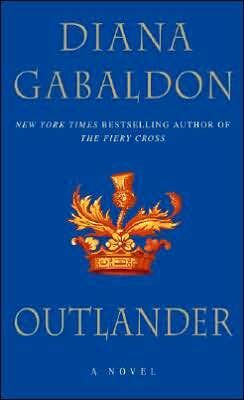 Also, a friend and I have decided to start an Outlander Book Club. It is her first time reading this series and it's fun to talk about the goings on of the book. I will start by saying that this book isn't for everyone. It is an adult book with adult themes in it. The book starts off in the 1940's right after WW2 in the Scottish Highlands. We meet Claire Randall, a WW2 nurse, who is getting re-acquainted with her husband of 8 years. They married 3 days before the war broke out and were called into service. They decided to have a honeymoon to the place where they were married. Claire enjoys her time wearing non-uniformed clothes and her husband Frank is enjoying his time studying his family tree, especially one member, Jack Randall, a capt. during the time of the Scottish uprising. On an excursion to see some standing stones, Claire finds out the purpose of the standing stones, they are a portal for time travelers and unbeknownst to her, she is one. She is flung back through time nearly 200 years. When she arrives, she meets her husbands ancestor, Jack Randall. He is not what she expects and flees. In the process, she is rescued/caught by a Scottish raiding party and taken away from the stones to the castle of Leoch, the center point for the clan of MacKenzie. Here she meets Jaime (McTavish) Fraser. Trying to fit into the time proves tricky, but Claire finds the ability. What she is unable to do is find away to get back to the standing stones where she traveled from. She is doubted by the MacKenzies and hunted by the English. She is thought of as a spy, but no one knows who for? To avoid being handed over to the English, Claire and Jaime are married for her protection. Things aren't all that simple however. Jaime is hunted for a bounty on his head. There is fighting, blood, romance, hurt, betrayal, there is a little bit of everything in this book and a lot of History. I enjoyed this book, and say it's a to read!